Now that you’ve started the project, you’ll want to assign your first task to get the ball rolling on this assignment. 1. 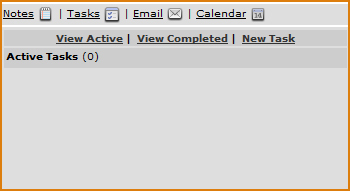 Click the TASKS tab (middle right). 3. Fill out the task details. Task Description: This will usually include a brief outline of the task and details of what is required. 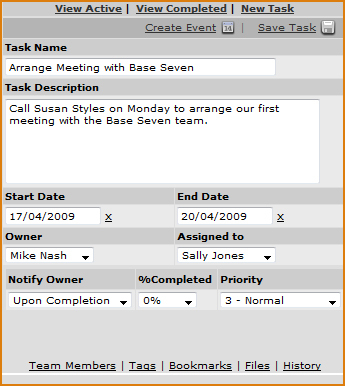 Start Date: The date on which you would like work on the task to begin. End Date: The date at which you expect the task to be completed. 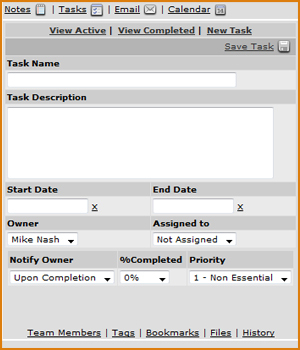 Owner: The person in charge of keeping track of the task and ensuring it is completed. This is usually the person who assigns the task. Assigned To: Select the team member the task is for. In order for you to b able to select a team member, you will need to have two or more users using Kazeli within your organization. Learn how to add Team Members. % Completed: The level of progress that has been made on the task. Priority: Select a priority from 1 to 5. You will set this to a Normal priority of 3. Next, you’ll learn how to create a Calendar Event from the task you’ve just created.